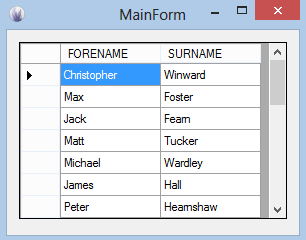 This demonstration uses one DataGridView component in an Oxygene WinForms application. It uses the same Firebird setup, CONTRIBUTIONS.FDB database and connection string as our Oxygene for .Net console example. The code follows a screenshot of the accessed data in the DataGridView. This C# page was helpful. /// Summary description for MainForm.